More than 600 people from around the state gather in Olympia each winter to give our elected leaders one very important message: Everyone in Washington state deserves the opportunity to live in a safe, healthy and affordable home. Since 2013, we've supported our partners at Washington Low Income Housing Alliance, the hosts of this important advocacy event. This year saw the debut of the Social Media 101 for Housing Advocates training! Before HHAD, our partners at Firesteel and Washington Low Income Housing hosted a webinar via a Google+ Hangout with advocates all over the state, including our "viewing party" at Seattle U. Then on HHAD, we met with lawmakers to urge them to support important legislative agenda items, including funding for affordable housing and implementing reforms to tenant screening. Three of our Seattle U student project assistants attended, along with our project manager and project coordinator. See what you missed in this photo story from our project via "Prezi." Afterwards, our student Perry shared her reflections about "Standing on the Shoulders of Giants," the advocates who have blazed a trail. We also reminded legislators that with a fact sheet that our partners used throughout the session. 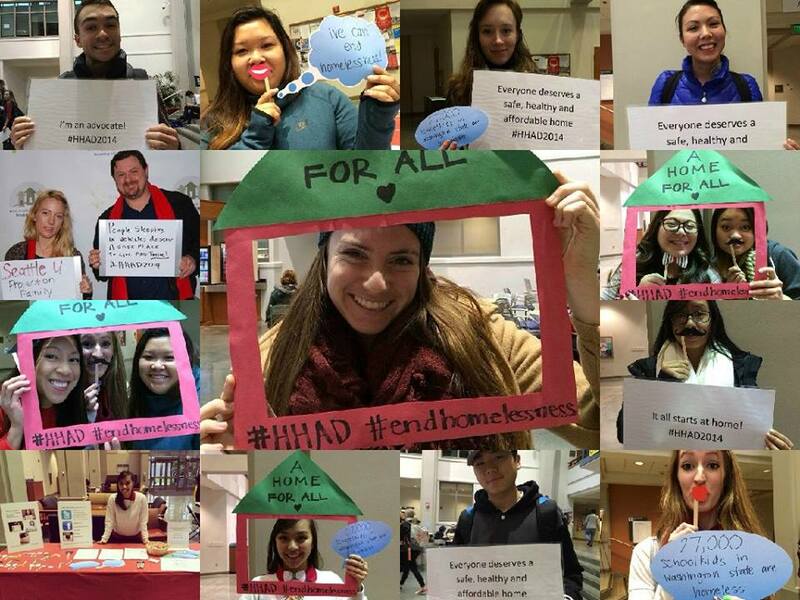 In addition to our team advocating in person, one of our students hosted a campus photo booth where Seattle U students could snap pictures of themselves with advocacy messages and post them on social media. Our student Tiana shared her nine tips for a successful photo booth advocacy event on Firesteel. The campus photo booth was back, and more successful than ever! 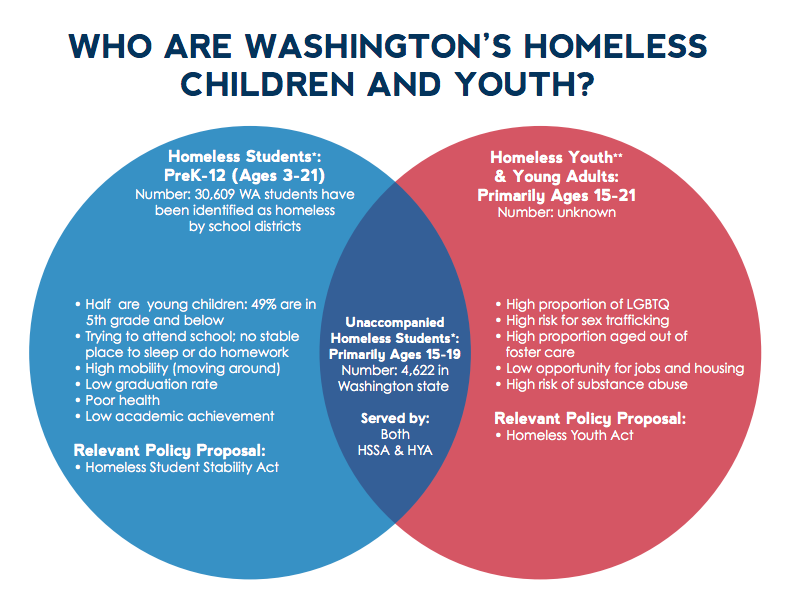 Meanwhile, advocates in Olympia shared with legislators this handy Homeless Children and Youth infographic CLS NOV 26 FINAL, created by our project assistant Krista Kent. 2016 and Beyond: See the more current projects for HHAD on our Portfolio Site. For more information about HHAD and about advocacy all year long, visit the HHAD Web page. 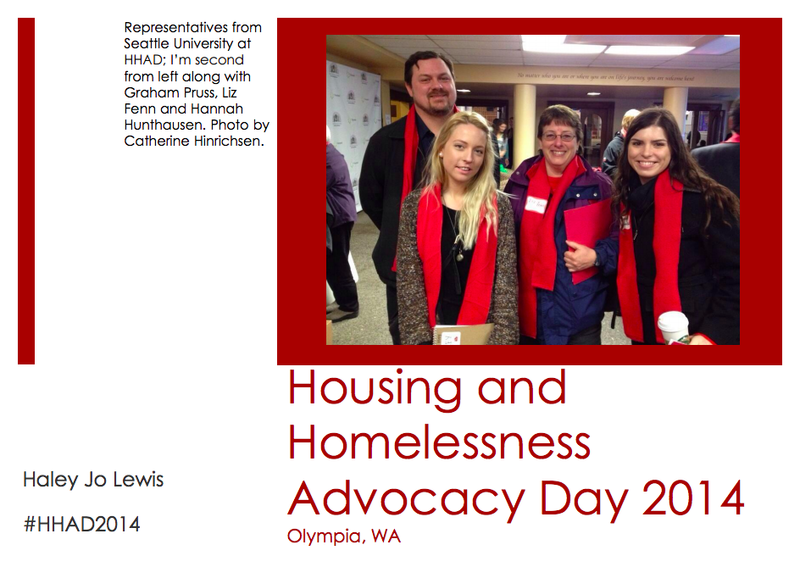 Housing & Homelessness Advocacy Day is hosted every year by our partner, the Washington Low Income Housing Alliance. Remember to keep advocating all year long!